I brought the ingredients home a couple of days before and let me just say we have all heard stories of mother’s who hide cookies and treats in the house so the kids don’t eat them all in one sitting. Although I have been surprised to see a whole package of chips devoured in a blink of an eye, for the most part, I would rather not hide refreshments from the young man. Now, as case in point, the ladyfingers. He found the ladyfingers in the cupboard and was having a sweet time dipping them in milk, just long enough for perfect absorption and he was already a half a dozen in when I discovered his fun. My first thought, the tiramisu! He looked up at me and said, “These are great! What are they?” and then proceeded to happily give me a lesson on how to perfectly time the dipping without letting the cookie dissolve in the milk. I sat down and dipped one, perfectly timed of course and yes! he’s right, they are delicious! Then his friend stopped over and joined in. At this point I relinquished my tiramisu idea, well at least until I run to the market and load up on ladyfingers. Oh, and it was Valentine’s Day. Yes, this was going to be my “special” Valentine’s dessert. Perhaps a bowl of leftover ladyfingers on the table after dinner will suffice. When it was all said and done we were only down by eight, yes, I counted. I made the tiramisu anyway and it was wonderful. The process is so easy; melted chocolate, mascarpone and heavy cream whipped, chilled and dusted with cocoa. And lady fingers, don’t forget the layers of lady fingers. Silky, creamy, chocolatey and rich; it was like eating the centers out of a half-dozen truffles and we loved it. Thank you lovely Jovina for the recipe and the inspiration to make a dessert I have loved for many years. In a medium bowl, mix cocoa powder with 1 1/2 cups very hot water until dissolved; set cocoa mixture aside. In a small microwave-safe bowl, place 1/4 cup cream and chocolate; microwave in 1-minute increments and stir until melted. Cool to room temperature. Transfer cooled chocolate mixture to a mixing bowl; add cheese and sugar. Using an electric mixer, beat until blended. Add remaining cream; beat filling until fluffy, about 2 minutes. Spread 1 cup of chocolate filling in the bottom of a 2-quart serving dish. One at a time, dip 6 ladyfingers in cocoa mixture, then arrange in a single layer in the bottom of the dish; spread with 1 cup of chocolate filling. Repeat with three more layers, ending with filling. Cover tiramisu and refrigerate at least 2 hours (or up to 2 days). Dust with cocoa powder or shaved chocolate before serving. I’ve been looking for a simple tiramisu recipe! Looks great! One of my favorite desserts. I haven’t made it yet, not sure why, but it is on my list of good eats to make at my Dailey Bistro. I understand there are more traditional tiramisu recipes, but this one was very good and decadently creamy. This was my first time making it! If you enjoy a chocolatey creamy mousse-like dessert, you will enjoy this. Hope you get a chance to try it! Very good! Thank you so much, my friend. Recipes were meant to be adapted. I love your post and the story you told. I am so happy and humbled to read that you were inspired by one of my recipes. Oh my goodness. Rich and decadent. Tiramisu is one of my favorite desserts. So lovely! I want some! Awesome! You made it sound so easy! :)) few things look more complicated I guess ;). Your tiramisu is teasing me! The ladyfingers story is funny. I’ve forgotten how it tastes like so I should look for it next time I go to the supermarket. Hi there Dolly! I don’t know if you drink milk…but I don’t think I would enjoy them without milk. Well, some tea might be nice, or an espresso? They must be dipped though! Haha, this is great; I can just picture him doing it, and it reminds me of my 16 year old brother who still has our Mum take him milk and bourbons before bed. He thinks he’s cool, but we can all see he’s a Mummy’s boy. 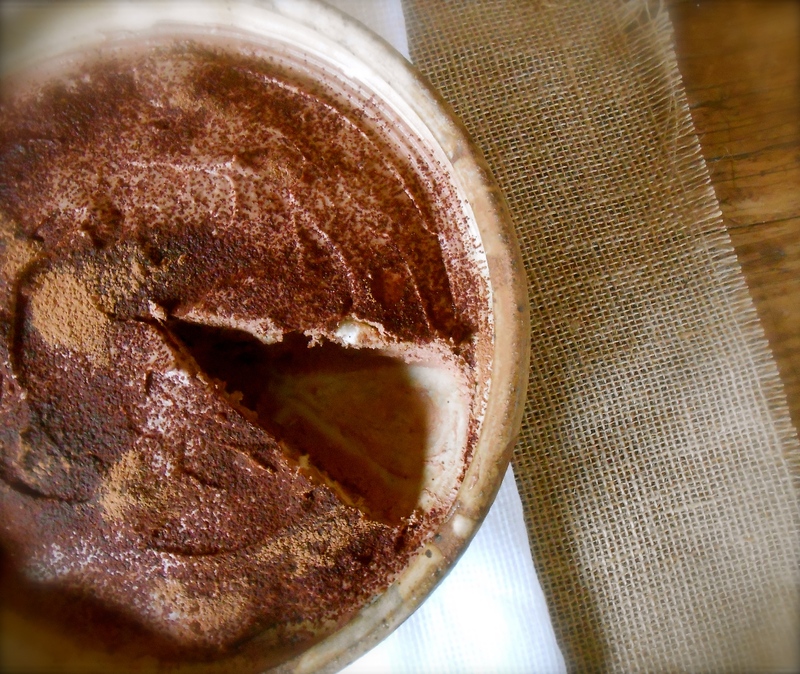 I love tiramisu, and chocolate, so extra chocolate can only mean the best tiramisu ever! BUT, I also LOVE a good old English trifle, and sherry soaked lady’s fingers with lashings of custard, fruit, jelly and cream … it’s a tough one; if I was at a buffet I think I’d have to have a bit of both! ARGH! Too many wordpress accounts! Ha! I kept wondering who is percipiotuition? Your comment made me laugh! It’s so typical isn’t it? A teenage boy has a hard time not having mom do special things for them! I’m wondering, what are bourbons? And honestly, sherry soaked lady fingers with custard, fruit, jelly and cream? This is something I think I would like very much! As for the trifle … now I have mentioned it I really, really want some. I have a busy weekend, but next week I might make some and post about it so I’ll let you know when the recipe is up. Oh good! You got back to me, thank you! You sound very busy. I’ll check out the link and I’m looking foreword to your trifle post! :) Do let me know if you remember so I don’t miss it! Good day! 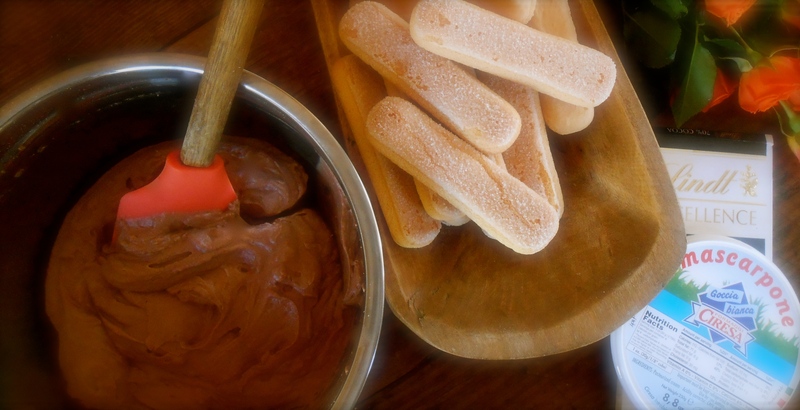 what a lovely lady finger story :-) Great dessert–tiramisu is tops! You’re up for Best. Mom. Ever. award with this one. Hee, hee! Well, perhaps this a wordpress award you could invent!! :) Just kidding. It takes all the patience I can muster sometimes, and other times I am not fazed at all by his button pushing! :) And yes, this really is a great dessert! Next time perhaps I make it with Kahlua! Making your own ladyfingers? Wow. I wouldn’t of even thought to do that. Now you have me curious, I must search out the recipe, not to make them, but to just look at it! Tiramisu is one of my all time favorites, never tried without coffee and I think this is perfect for non coffee lovers. All that chocolate is wonderful!! I think this is the first time I had it without coffee too. It was great! Sort of reminded me of chocolate mousse. Super rich and we loved it. lovely post. there is something so wonderful about making beautiful things to eat with your loveys. Yes. Lovey’s in the kitchen with me are my favorite times. Especially when you are making something they love. Their excitement for the ingredients and the outcome of the recipe is endearing. How delicious! It looks truly amazing! Good to know. My girls don’t like the coffee flavor and so I never make tiramisu’. This looks like the delicious solution I’ve been looking for! You got it. And I’m with you…tiramisu’ really needs coffee! Tiramisu without coffee. How interesting. This is great for children. I shall certainly be trying this. Have a lovely week! Hi Liz. Thank you and that was the first thing I thought when I saw this recipe on Jovina’s blog. No coffee? Perfect for children. And it was! It never occurred to me either until I was typing the post and realized I didn’t bake it. :) Isn’t it a wonderful refrigerator cake? Good recipe, thanks! I love tiramisu, but the raw eggs always worry me when I’m preparing it for friends or family, so this one is a good option without them, will definitely try! I’m alway leery about using raw eggs and especially serving them to children! You are right, this is a good option, keeping it stress free! It’s worth making, you’ll love it. Tiramisu is such a light dessert. I always have room. This recipe is slightly different and quick which I like. It’s true Maria. I love a a light, airy, delicate textured tiramisu, made with espresso and whipped eggs. This particular tiramisu recipe is quite rich, which is lovely, in small servings. Thank you Beth. I’m not much of a baker or dessert maker for that matter…you can tell by my scarce recipes in the dessert section. This one is very simple and error free, definitely my kind of baking too. Finally an easy AND scrumptious tiramisu recipe. Yours looks beautifully presented, and so creamy, dreamy and rich, Seana. I love the idea of a simple tiramisu, I’ll definitely be giving this a try! That was so charming. And isn’t that the best part of dessert? Besides having to improvise. I’m sure that’s where quite a few ideas spring from. Having said that! The very idea of me wearing a loincloth! Not even in public. :) Yes, I’ve just been into Saucy Gander’s post. And your comment made me laugh with absolute glee! See? That’s exactly how rumors get started! I either heard or read it somewhere?? Hahahaha!! I appreciate the invite and what a gas! It really is a fun event Angie! Thank you for getting me involved. Thank you Sophie…wonder how this would be with your vegan mascarpone… sorry to hear you are lactose-intolerant. Nice to hear from you today. Yum to you and your easy and beautiful tiramisu! Great recipe. The tiamisu made with chocolate sounds delicious. How can I say no to this classic! A must have after a good Italian meal. This tiramisu looks so good, Seana. I have never made a tiramisu, but I’m feeling this should be my next challenge (along with about a dozen of your other recipes)! I love the simplicity in amount of ingredients but yet the delight this has to cause. It looks great! I love how simple this is. I will have to give it a try! I must say, tiramisù is still one of my favourite desserts…And I tried several recipes…:-))) This is a nice chocolate variation! Luscious– every 16 year old boy should have a mom like you! You are currently reading tiramisù at COTTAGE GROVE HOUSE.